After the Deripaska fiasco, you would’ve thought George Osborne would just lie low for a few weeks and keep his name out of the press. How are we going to dig our way out of this one? Now I don’t know a great deal about politics or economics, but it didn’t take me long to realise that Osborne made a massive blunder in predicting a run on the pound. Whilst the credit crunch begins its slow and painful transformation into a full-blown recession, what we need right now is confidence coming from the top in order to begin to turn things around. It may be the Conservatives’ role to criticise Labour’s every move, but shattering public confidence in the stability of sterling is just plain irresponsible. There are plenty of other ways to criticise Labour at the moment, and Osborne’s leader seems to be doing pretty damn well in reaction to the case of Baby P.
Osborne is, of course, obliged to be critical about the economy, but his actions have grave implications for the whole financial system. It seems he has an ‘if I’m going down, I’m taking you down with me’ mentality. And yet he refuses to apologise, and may even lose his post as a result. There are some times where ‘telling the truth’ can do more damage than good, and you would expect a prominent politician to be aware of that. This may be the time for a novice, but it’s certainly not the time for a maverick. Just ask John McCain. I’d be interested to know if anyone can defend his behaviour this week. George Osborne is paid to warn of such risks, and he is absolutely right to do so. In this highly predictable piece he effectively spouts the typical Tory line, but since he can no longer sit in the Commons and berate Brown face-to-face, he has to find a new medium for his partisan accusations. Mayor Johnson’s biased ramblings aside, I think it’s a bit cheap of the Telegraph to print this. Trying to snare in readers with a big name opinion piece by any chance? ← One For The History Books? You’re right to say Osborne is probably making a bad situation worse, but I think journalists and politicians should start talking more candidly about the economy. Maybe if people had been more critical sooner we wouldn’t be in this mess. I think we are lucky that the public apathethic feelings towards politicians have probably limited the number of people that listened to George Osborne. What concerns me is when every newspaper on the stand is proclaiming ‘We are all going to die because the economy is broken.’, in the vain hope that their horror stories will sell more papers that day…I suspect that the front page of the paper holds a greater sway over minds of the British public than the shadow chancellor, so I see it as a much greater threat. 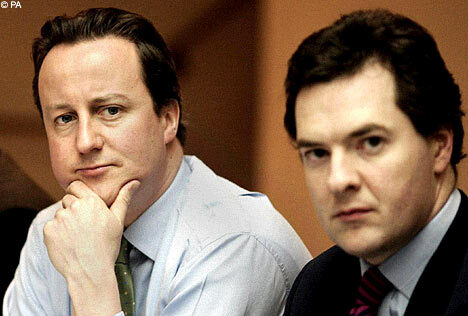 Osborne has every right to criticise the Government on the shortcomings of their policies. After all that is the very purpose of Her Majesty’s Opposition. As for Mr Johnson. Every columnist has a political bent. Take Toynbee in the Guardian and Little-John in the Mail – you could’nt find more partisan views. The purpose of high profile columnists is to shift papers. I found your blog when I did a bit about George on my blog, which roused an angry response from one of his supporters!